I CAN MAKE THIS WORK...: Docker and Configuration on Azure Web App for Containers: Whither Colons? Docker and Configuration on Azure Web App for Containers: Whither Colons? 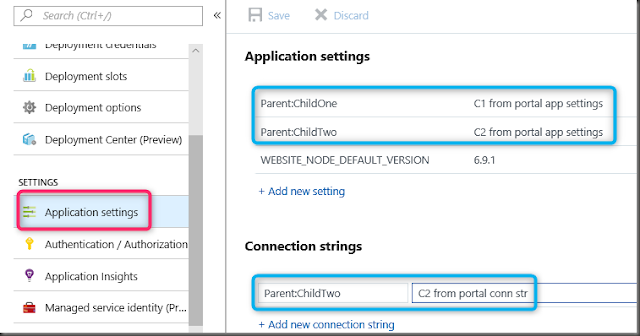 App Services have long been a super simple way to spin up a web app in Azure. The barrier to entry is low, maintenance is easy. It just works. App Services recently got a turbo boost in the form of Azure App Service on Linux. Being able to deploy to Linux is exciting enough; but the real reason this is notable because you can deploy Docker images that will be run as app services. I cannot over-emphasise just how easy this makes getting a Docker image into Production. Yay Azure! 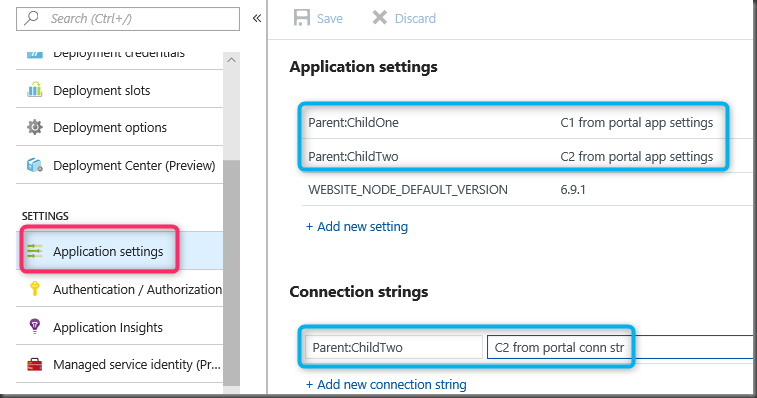 With a classic App Service you could override a setting in the appsettings.json by updating "Application settings" within the Azure portal. You'd do this in the style of creating an Application setting called Parent:ChildOne or Parent:ChildTwo. To be clear: using colons to target a specific piece of config. When you hover over the error you see this message: This field can only contain letters, numbers (0-9), periods (". "), and underscores ("_"). Using . does not work alas. So it turns out you just can't configure App Services on Linux. Where you use : on a classic App Service, you should use a __ (double underscore) on an App Service with containers. So Parent__ChildOne instead of Parent:ChildOne. It's as simple as that. Honestly? No idea. I can't find any information on the matter. Let me know if you find out.